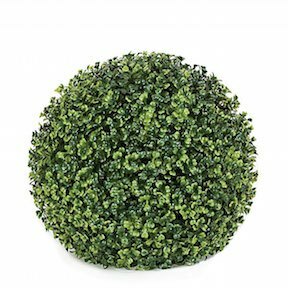 13 Inch Polyblend Plastic Boxwood Topiary Ball for Outdoor Use. Looks wonderful on your Deck or yard coupled with your own special garden greenery. Landscaping for outdoors? Learn about our polyblend material that will extend the life for outdoor topiaires and more. We can also custom make outdoor topiary artforms such as animals. people, trumphets, etc.